Angelica is from the Chirijuyup farm, Aldea Vásquez, in the Department of Totonicapa, Guatemala. She was selected as a GOJoven Fellow when she was 24 years old. 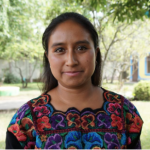 Angelica is a young female leader who is sociable, collaborative, participative and respects human rights. She likes to work with girls and adolescent women and currently works in the Redmi Aq’ab’al Association. Her work involves the themes of Sexual and Reproductive Health, especially the problem of the lack of information in the Integral Education in Sexuality.